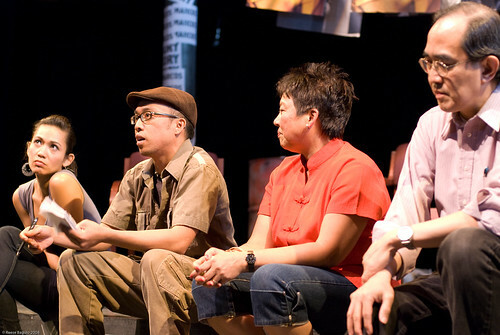 We had our first post-people power discussion panel last sunday 20 april. Ricky Esguerra (a former political prisoner and longtime activist), Martha Ocampo (a former CAMD leader and long time activist, her sister is currently a political prisoner), and Alex Felipe (a documentary photographer) spoke about the situation in the Philippines since the 86 revolution. Was it a success or failure? And where is the country today? If you missed last week (or just can't get enough!) 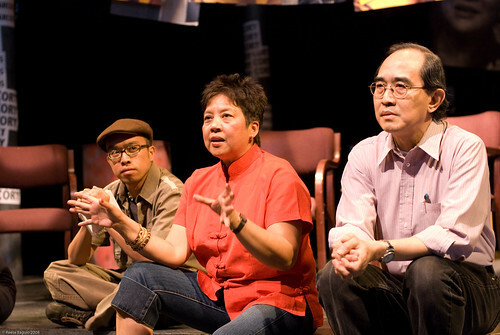 join us EVERY Sunday after the 2pm showing of People Power for a second panel until the end of the run! "PEOPLE POWER is one powerhouse of a production"
"A chapter in Filipino history comes alive in thrilling ensemble piece." "Need evidence that a culturally oriented theatre company can fly sky-high? Check out the collectively created PEOPLE POWER..."
"PEOPLE POWER radiates a high-power energy that lights up the stage." "That five people can portray taxi drivers, street beggars, soldiers, politicians, journalists, students, prostitutes, exiles, and socialites convincingly is impressive in itself, but to add to that, they get the audience to participate, turning them into rioters or presidential hanger-on and making a story we are separated from by geography, culture and the passage of time something much more immediate."